Please, please, please come up with a better model name! I mean, does the NS-40503RW inspire you to buy it? We've had this beef with a number of manufacturers and can't see why they can't be more creative when naming their rowing machines - see What's in a Name? Okay, so enough of that. What about the machine itself? Is it worth considering if you're on a budget? Well it's certainly up against a lot of competition in the sub $300 price bracket. But, it does have some good features that make it worth a second glance. First things first. It's not too difficult to assemble, but you may need some assistance if you're not experienced in flat-pack or basic DIY. Once that jobs sorted, you'll notice the seat is actually pretty comfortable. 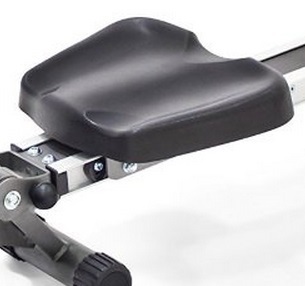 We've tried many low-cost rowing machines that need additional padding on their seats, but this one is well contoured, and soft while still providing the right kind of support. The rowing position is good, although if you over 6 foot tall you may find the beam isn't sufficient to complete a full drive (the pull back) which means you won't get the full benefit for your muscles and cardio-vascular system - see here for an animation of rowing technique. But if you're not this tall, the angled beam/rail adds a little extra work for your muscles to do. The footrests are average. While they're a good size and will suit most feet, the velcro strap will need to be cleaned occasionally, otherwise they won't hold your feet securely - and there's nothing quite so frustrating as a foot coming loose in the middle of a workout. We do like the handle. It's well-padded and shaped to fit nicely into most hands. A poorly-designed handle will lead to hand blisters - and believe us when we say it ain't easy to row with blisters! The resistance is provided by a magnetic flywheel and is quiet in itself, but we found the seat squeaks when running up and down the beam. There are eight resistance levels available which are selected by the knob situated under the handle. The range is varied enough for low levels to provide a relaxed row, and at the highest setting to be challenging unless you're used to really vigorous workouts. For more on how to use resistance levels in your workout, please click here. On a budget model you have to manually set this level, if you want a machine that automatically sets resistance to keep you in the fat-burning zone, you have to be prepared to pay a heck of a lot more - see the LifeCore R100 for what's available for top dollars. 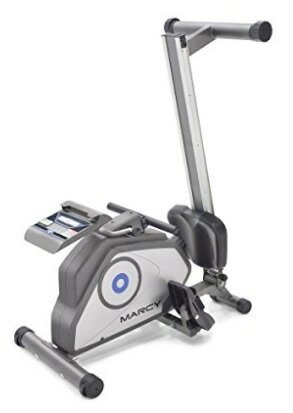 Weighing in at around 60 lbs, this is sturdy enough for most, but if you're towards the upper limit of the maximum user weight (300 lbs) it will move around when giving it some stick! Note, this is a folding model - see photo right. It's quick and simple to fold up, and the transport wheels make it easy to move around. However, it still has quite a large footprint when stored away. It's always going to be a basic monitor with a model costing under $300, so let's not get our hopes too high. However, it's a good-sized LCD display and easy to use. The workout data displayed is limited, but it will show you time-elapsed, the number of strokes and the calories burned (although it's estimated). Update: Jan 2017 - the new monitor displays distance in meters, this is a big improvement on the last one. 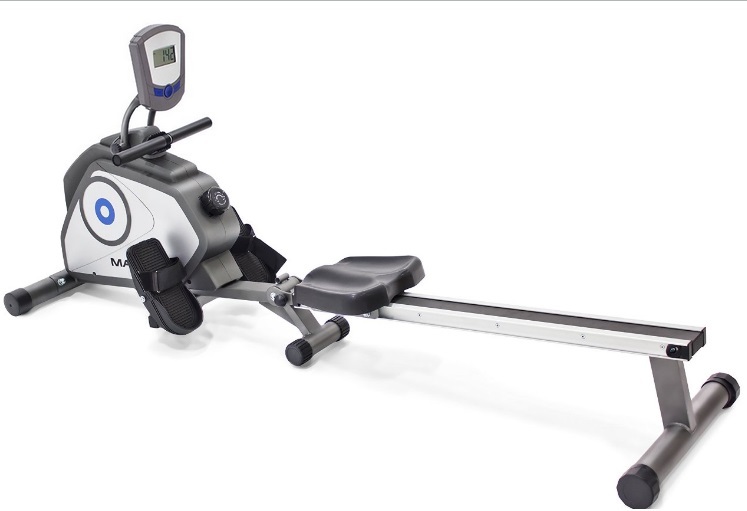 The display height can be adjusted for easy reach, and uses 2 x AA batteries which means you don't need to plug the rower into the mains - but note, they're not included. As with all budget models, this isn't suitable if you want a really punishing regime. 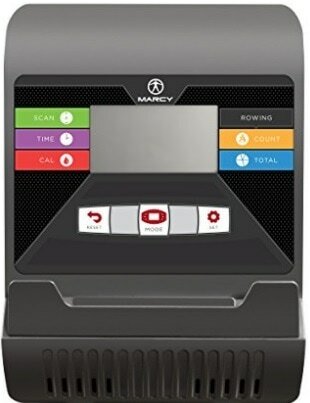 You get what you pay for, and the Marcy will give you a reasonable workout for around 15-20 minutes a day and help you to burn calories at home. Plus it does look like it will last a few years. 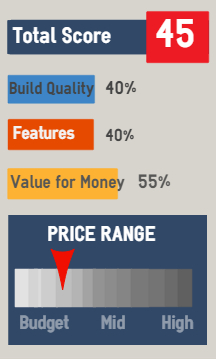 There;s plenty to choose from in this price range but not too much that offers more value for money. The most obvious competitors are the popular Proform 440R and Sunny - both are also magnetic rowers.